House of Cards Season 6: Why Did Netflix Move Forward? Why Did Netflix Decide to Move Forward With a Final Season of House of Cards? 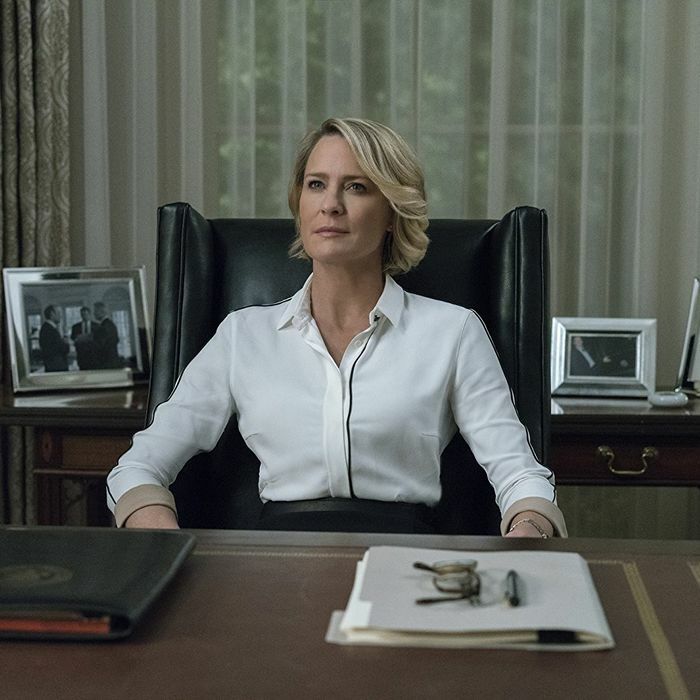 When Netflix’s House of Cards resumes production next month on its final, Kevin Spacey–free season, the cast and crew won’t be picking up where they left off. Producers plan on scrapping most, if not all, of the footage shot during the roughly two weeks of season-six production that had taken place in October, two people familiar with the situation have told Vulture. The two episodes filmed will now be tossed, as will most of the five or six scripts that had been written with Spacey’s Frank Underwood character still part of the show. It’s a dramatic — and costly — decision, but it was probably also the only logical way forward if Netflix and Cards studio Media Rights Capital wanted to continue post-Spacey. And to be sure, there was a brief period last month when the prospect of Cards collapsing completely was very much on the table. While Netflix and MRC execs declined to comment on the record about how they got to this week’s decision to continue with a shortened, eight-episode final season, an industry source not connected with either company confirms that simply walking away from Cards was given at least some consideration by Netflix executives in early November, just as the flood of sexual-assault and harassment allegations against Spacey began pouring out. It’s not all that surprising Netflix mulled this course of action: It would have been the simplest path forward. Remember, unlike so many of its more recent hits, Netflix does not own or produce Cards. The streamer essentially leases episodes from MRC, an independent production studio. By canceling Cards, Netflix could have made a clean break from Spacey and the now-tarnished series. Netflix “wanted the stink off them,” as our source explained. What’s more, cancellation would have probably been cheaper. Sure, there would have been costs associated with permanently halting production, but both Netflix and MRC could have taken a write-down on the losses, the way big movie studios do when they produce a box-office bomb. Instead, Netflix will spend at least $50 million — and likely much more — to acquire the season-six episodes from MRC, not to mention millions more to market and promote the final season. Neither Netflix nor MRC have talked recently about the price of Cards, but given the first two seasons of the show cost the streamer $100 million, according to multiple reports at the time, the show’s season-six budget is almost certainly significantly higher now. Even before the Spacey scandal, our source notes, Netflix “had mixed feelings” about Cards, as evident in the decision — made months ago — to wrap the show after six seasons. “There were diminishing returns,” he explains. Still, despite the advantages to making a clean break, it’s not much of a stretch to assume Netflix and MRC didn’t want to allow Spacey’s bad behavior to determine how the series came to an end. Plus, Cards will always hold a special place in the (ever-expanding) Netflix canon. It was the first original series specifically commissioned for the service and, along with Orange Is the New Black and the short-lived Hemlock Grove, part of the first big wave of shows the streamer used in 2013 to herald its arrival as a legit competitor to linear networks such as HBO. It’s one thing to send off the Naomi Watts drama Gypsy without so much as a press release. But even a not-particularly-sentimental Silicon Valley-based company like Netflix understands the value in making sure such an important part of the company’s long-term legacy gets a proper burial. With Netflix and MRC staying mum, it’s hard to know exactly how tense the talks over moving forward got, and just how close Netflix got to pulling the plug. But one industry source says Netflix and MRC, following some early jitters, actually decided weeks ago to try to make things work. The delay in making it official revolved around two things: A desire to see how the Spacey situation played out, and giving the show’s creative team time to figure out how to bring the show in for a landing without Spacey onboard. Netflix and MRC suits “wanted to make sure they weren’t going to get hit by more bullets,” the source says, referring to the possibility of new allegations against Spacey related to his work on the set of Cards. “Barring something else coming out or the writers not being able to figure it out, the plan was to bring it back.” Spacey’s troubles did multiply as November wore on, but nothing emerged that made continuing Cards without him an issue. Meanwhile, Cards co-showrunners Frank Pugliese and Melissa James Gibson have been back in the writers room for weeks now; Netflix and MRC never stopped paying them, or the show’s crew. It’s likely the two showrunners pitched their new direction for the show before Netflix officially signed off on resuming production. House of Cards S6: Why Did Netflix Move Forward With It?